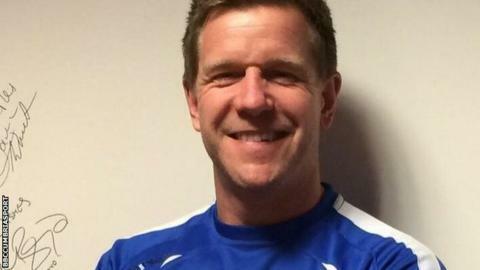 Barrow owner Paul Casson believes boss Darren Edmondson can turn around Barrow's form, despite reports that he has given him one month to improve the club's fortunes. But Casson says he is "not willing to give the season away". The Bluebirds were knocked out of the FA Cup fourth qualifying round, losing 1-0 to lower-league AFC Fylde on Saturday. Barrow are 15th in the National League, with seven wins and seven losses. "I want him to show people what he can do," Casson told BBC Radio Cumbria. "I firmly believe in him, but the other aspect is I can't wait, I'm not willing to give this season away. "I don't want a Bromley 5-0 loss, a Tranmere 1-0 win and then a Fylde [performance]." Barrovian by birth, businessman Casson made his money in America and completed his takeover of the club in May 2014. His first season in tandem with former Carlisle and Workington defender Edmondson secured promotion back to the National League. "It has nothing to do with points, though they're important, I want a manager to motivate the players to go out there time after time after time, who want to play for him, want to entertain the crowd, to score goals, to go forward, to play exciting football," he added. "I love this team, I believe in every last one of them, they're not showing what they can do, there's a problem there and I have to find out what it is. I'm hoping Darren can find out what it is in the coming months."